Hey, remember my Cheater's Recipe series? I haven't done one in quite awhile, but I'm resurrecting it now! For those who may not remember: Cheater's Recipes are barely recipes. They're more like assembly instructions, really. They're for people who are low on time or materials or are just not feeling ACTUAL cooking. Ultimate Example: grilled cheese using a pop-up toaster and microwave. Yeah. Anyway: here's a new lunch option for you! This Cheater's Recipe goes out to that time the office kitchen was out of salt. Pop your bagel in the toaster. While your carbs are subjected to fire, scoop out your avocado's innards and mash them in a bowl until they're a creamy consistency. If you want to add those extra diced veggies, mix them in here. Put your toasted bagel on a plate. 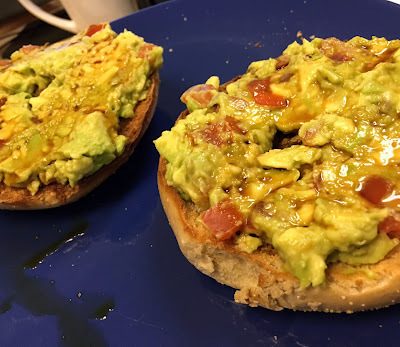 If you want to add hummus, spread some on first, then layer on your avocado mixture. If not, proceed directly to slathering the avocado all over your bagel. Garnish liberally with soy sauce. I mean, plain salt will amp up the taste too, but the soy sauce is what makes it a sushi bagel, plus it's a great option if you're out of salt but the office kitchen has soy sauce in the fridge (story of my life). And there you have it: my current go-to work lunch. Salty, carb-y, full of healthy fats and vegetables - the perfect lunch when you're going to go for a run later. Very few cheater's recipes are photogenic. What do you think of this Cheater's Recipe? Am I suffering my soy-sauce fueled insanity or would you totally try this? What's your go-to work lunch?